Fenugreek leaves are known for their health benefits. Both fenugreek leaves and seeds are widely used in Indian cooking, in spite of its bitterness. The leaves are used in curry, side dish, rice, bread – everything you can think of really. I have grown up loving fenugreek lentil dal (sambar). But nothing could match the ‘menthya soppu poori’ (methi poori) for me. 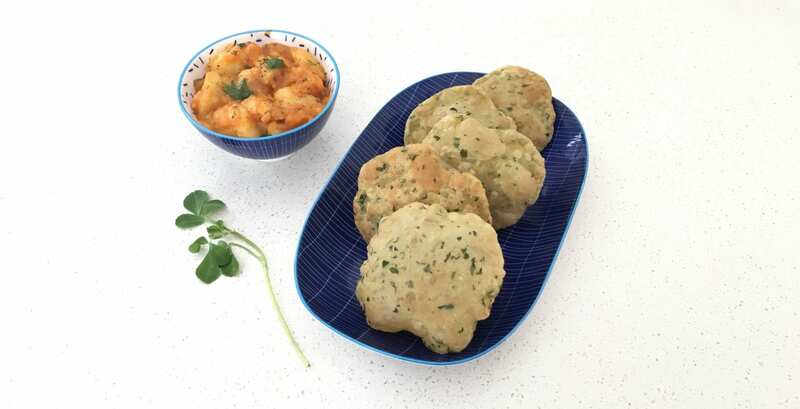 Typically pooris are served with Saagu (mixed vegetables in coconut base) in my house. But I really like these particular pooris with a simple potato curry. Finely chopped fenugreek leaves mixed with whole meal flour and fried; served with potato curry – perfect weekend brunch.